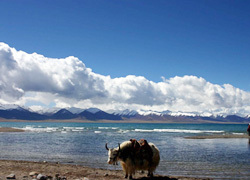 Nagqu is one of the important political, economic, cultural and trading centers as well as a transport hub in Tibet. It is also the collection and reshipment centre for the region's animal products, mineral ores, and agricultural and forestry products. Nagqu has a unique landscape. The ancient Yamtung (or Zhangzhung) cultural site, the Bon monasteries, the Holy Lake Nam-tso( or Lake Nam co) and the life of the highland herdsmen are unique tourist attractions. In Nagqu, the vast Changtang grassland commands unique geological features and changing natural landscape. The great force of nature has shaped the gorgeous mountains and rivers of this region. Lake Nam-tso, Lake Tangra Yumco and over 1,000 others are like jadeite scattered on the grassland or gobi desert. 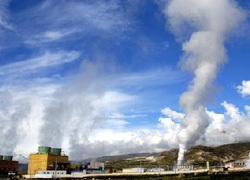 There are numerous hot springs and geothermal spots. The region also has rich resources of wildlife and alpine vegetation. There are over 20 animal species under level one or level two national protections. 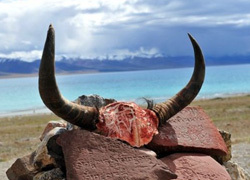 Such rare animals as wild yaks, Tibetan antelope, and Tibetan wild donkeys are being well preserved in the area. There are still more places worthy of visiting in Nagqu. Tourists will be impressed by the great grassland, the holy lake of Nam-tso, and the mysterious depopulated area in the northern Tibet. Held around August 10th, Nagqu Horse Racing Festival is the most magnificent in north Tibet. In the golden season of grassland, tens of thousands of herdsmen from various parts of Tibet, in their holiday best, come to Nagqu on their horses with various kinds of goods and materials. They put up tents in the southern part of Nagqu town. During the festival, thousands of tents with painting of all kinds of Buddhas will be set up in the area, lasting for miles. It makes the grassland look like a small town. On the day for the opening ceremony of the festival, people from all over the Tibet will pour into this grassland.